Since I’m stuck helping out on a lovely Saturday, I figured I may as well have a little bit of goofy fun, so I’m starting this new series: Imaginary cars, from imaginary countries. I’m just going to make up a car and a country, and then quickly sketch whatever stupid thing I’m thinking of. Sounds fun? Too bad, I did it anyway! We’re going to start with a hardworking utility vehicle from the European nation of Pandolvia, which is a small, Andorra-like nation squished between the shared border of Poland and Greece. You know the one. Pandolvia is a small and generally poor country, but one with a rich mule-breeding culture. Pandolvian mules were the mules to have from the late Middle Ages up until the mid-1800s, when early experiments in genetic engineering caused the entire stock of Pandolvian mules to be born hairless, which just creeped the hell out of everyone. 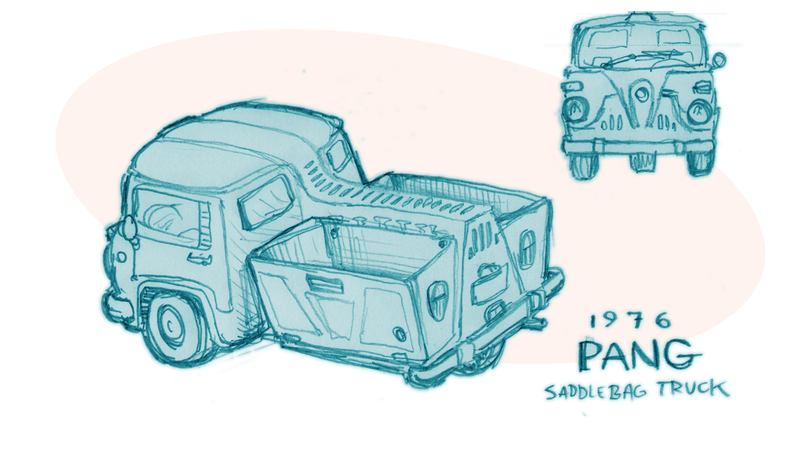 As a result, Pandolvians have been developing mule-replacement vehicles from the earliest era of motoring, and have gotten very good at building a very specific type of cheap and rugged utility vehicle: the saddlebag truck. Designed to replicate the side-mounted loading bags traditionally used on mules, the Pavlovian Automobilistî Nøcktremmik Gåenstphabrik company (that translates to Pavlovian Automobile-Mule-Replacement Factory) has developed three-wheel trucks with dual side-accessed load beds, much like this 1976 PANG Saddlebag truck shown here. The PANG is mid-engined, with a 41 HP, 799cc two-stroke inline-3, originally licensed from DKW, mounted longitudinally in the ‘spine,’ and driving the front two wheels via a three-speed manual transmission. The engine is water-cooled, with twin radiators mounted low in the front of the cab, with shutters that can open to optionally blow radiator-warmed air into the cabin in winter. These trucks are very rarely seen outside of the Pandlovian mudlands, but there is one in the United States, part of Nathan Lane’s extensive collection of rare automobiles that he keeps in the Great Hall of the ice dancing/target shooting resort he runs in Colorado. I hope you found this educational! Now you know several new things that aren’t true at all! I do hope this was at least a little fun for you.